Traverse on an ancient route where unpredictable weather and beautiful scenery combine for an awesome adventure. A beautiful traverse on cross-country skis over the Icelandic highlands. Your highly experienced and knowledgeable guide will lead you from the high grounds above Akureyri in the North, over the deserted Sprengisandur, which is the ancient route between the Hofsjökull and Vatnajökull glaciers – to Landmannalaugar, an area of high geothermal activity. This is a journey through the center of Iceland is challenging and rewarding. Because this area is not easily accessible in the winter time, you will encounter wide open spaces and impressive mountainous landscapes with no one else around. Snow, ice, fire and water come together to create an enchanting winter world. While you are surrounded by amazing nature, the unpredictable weather and isolation make this tour a personal challenge for many participants. After a long day of skiing, you will get some much deserved rest in a hut or tent, depending on where we stop for the night, and enjoy a delicious meal. 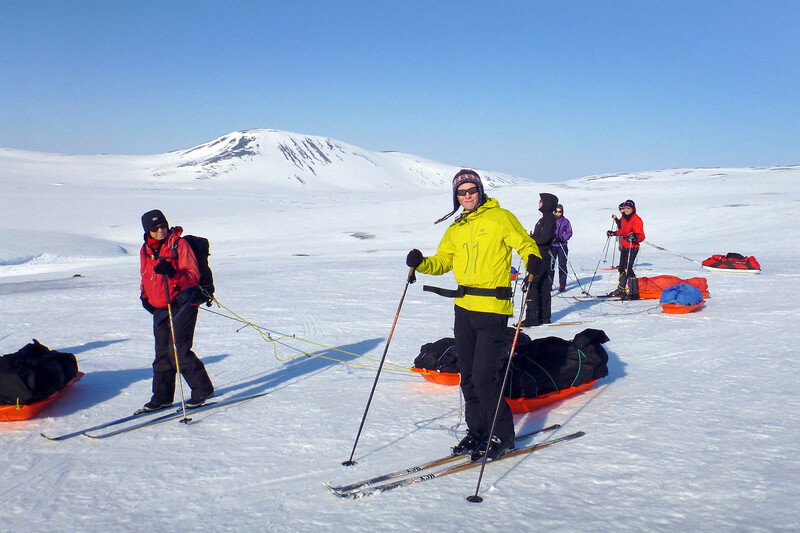 We recommend this tour as a preparation for the Greenland crossing. For beginners in cross-country skiing, we recommend the Landmannalaugar cross-country ski tour before attempting this crossing. Cross-Country Skiing and Ski Touring: Whats the Difference?